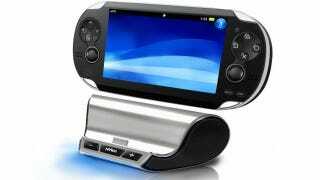 Available now at GameStop locations across the U.S. Nyko's Speaker Stand for the PS Vita adds a little more oomph to the Sony portable's sound, and transforms it into a handy mobile Skype solution. The Nyko Speaker Stand was one of the first accessories I went looking for when I picked up my launch Vita. Now I realize why I had so much trouble finding it: it wasn't out yet. But it is now, adding $29.99's worth of dual powered speakers to the unit, as well as an attractive place to sit (much easier than the Sony-brand charging stand) and a pass-through port so you can play your $3,000 stereo system ironically through it. It's a lovely little product, really, delivering deeper, richer sound easily. It's not a magical portal into a new world of aural pleasure, but then so few things are. As it turns out today was a rather fortuitous day to release the accessory, as today is also the day Skype becomes available on the PS Vita. I tried out a test call with our own Kirk Hamilton, and aside from the normal interference I get while streaming Netflix and making voice calls over the internet, it was relatively clear. Would I recommend picking one up just for Skyping? Of course not, it's a stand. Why would you pick up a stand? It defeats the whole purpose. Freak. That having been said, if you plan on making stationary calls that don't require panning down to your lap frequently I couldn't recommend it highly enough. Seriously, keep it up high. I don't want to see your junk.